I'm back from my visit home to Canada, which was fantastic, but of course too short. On the plane I was reading H.G. Wells' "The Time Machine", and was struck by the section below. In it, the time traveler describes the ideal state of the future world he has landed in, a world where man's improvements upon nature have reached their peak. "The work of ameliorating the conditions of life - the true civilizing process that makes life more and more secure - had gone steadily on to climax. One triumph of a united humanity over Nature had followed another. Things that are now mere dreams had become projects deliberately put in hand and carried forward. And what a harvest I saw! ... Our agriculture and horticulture destroy a weed just here and there and cultivate perhaps a score or so of wholesome plants, leaving the rest to fight out a balance as they can. We improve our favourite plants and animals - and how few they are - gradually by selective breeding; now a new and better peach, now a seedless grape, now a sweeter and larger flower, now a more convenient breed of cattle. We improve them gradually, because our ideals are vague and tentative, and our knowledge is very limited; because Nature, too, is shy and slow in our clumsy hands. Some day all this will be better organized... The whole world will be intelligent, educated, and co-operating; things will move faster and faster towards the subjugation of Nature. In the end, wisely and carefully, we shall readjust the balance of animal and vegetable life to suit human needs. This adjustment, I say, must have been done, and done well... The air was free from gnats, the earth from weeds or fungi; everywhere were fruits and sweet and delightful flowers; brilliant butterflies flew hither and dither." Scary stuff, huh? Not just because of technicalities, like the fact that doing away with those pesky gnats and fungi would mean the extinction of life, but because this is the kind of 'ideal' humanity has been aspiring to. I'm not judging Wells here, because a lot of his work actually explores the pitfalls of playing around with Nature. The scariest bit is that although we're supposed to be somewhat wiser and humbler today, in reality we're still on the same course described by Wells: the continuous improvement and subjugation of Nature to fit our needs. And we're all still doing it, including myself of course. There must be a better way of living with nature, but our society is not designed for it. I bike to work and eat most of my veggies from a CSA 5 minutes away where you pick your own. But I also eat meat from the supermarket, rent cars to visit gardens, and fly home to Canada. I spend countless hours on the computer every day, using resources that are destroying our planet to post and store silly blogs such as this. So what are we to do? I think we can try to stop and think about it once in a while. And do the little things, even if on their own they may not seem to change the world. Hermannshof is a fantastic, public experimental garden hidden in the small town of Weinheim in south-west Germany. The aim of Hermannshof is to showcase “successful examples of new directions in planting design, especially in the naturalistic planting style”. There is too much interesting stuff happening in this garden for just one blog, so this is part two. 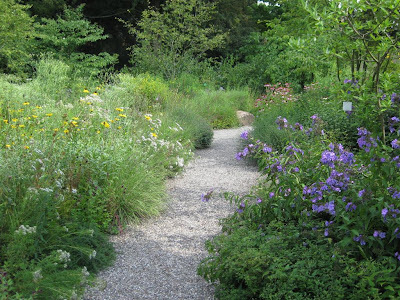 Last time I tried to give a little tour of the North American perennial garden, which uses many of the very striking flowering perennials we've come to know and love through the New Perennial movement. 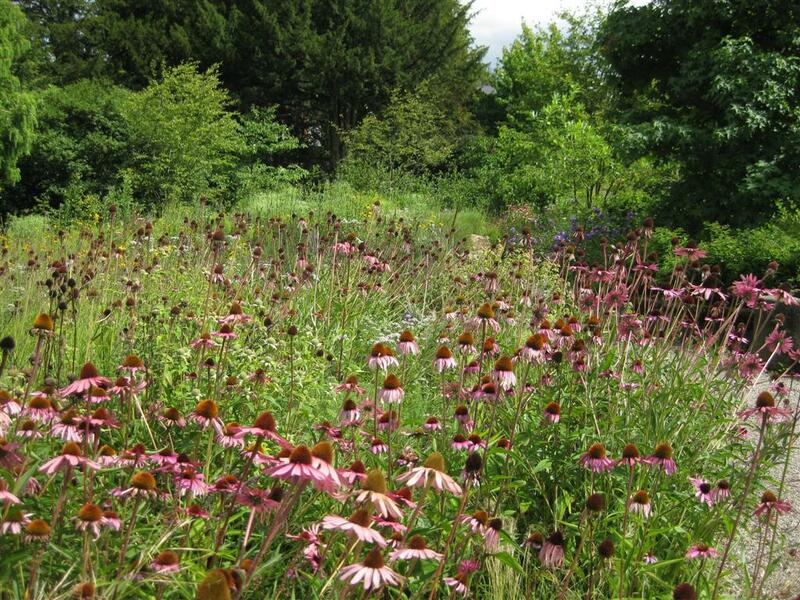 Although the North American perennial garden is open and uses a mix of both perennials and grasses, it’s a perennial flower garden rather than a prairie inspired garden. 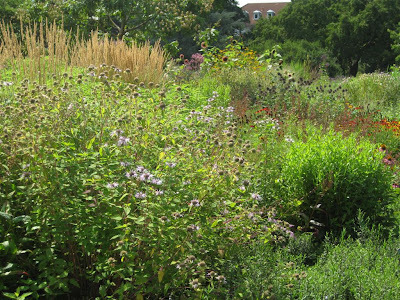 The separate prairie inspired gardens are the topic of this post. The prairie gardens are found at the entrance section to Hermannshof, and are based on the tall and mixed grass prairies of North America. 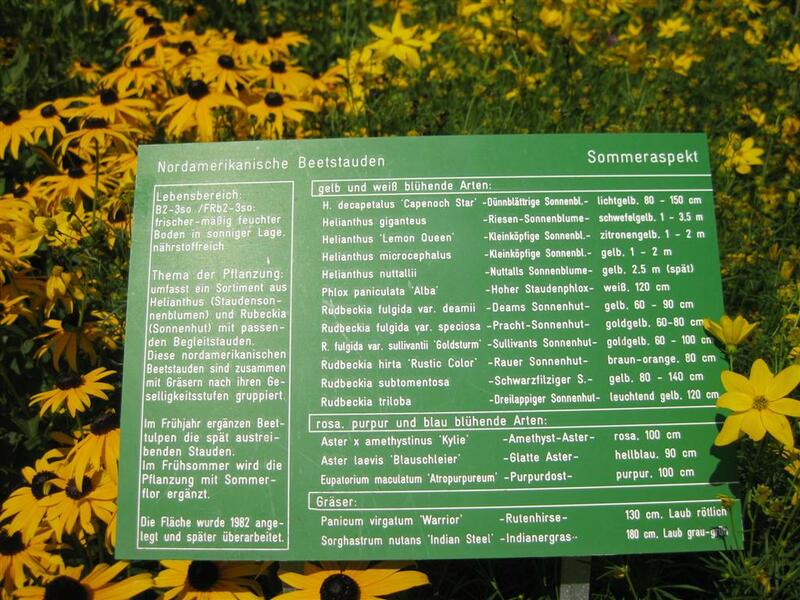 But signs are quick to point out that the gardens are not meant as a re-creation of a prairie, but rather an artistic interpretation of the prairie idea, which seems to so captivate European gardeners. 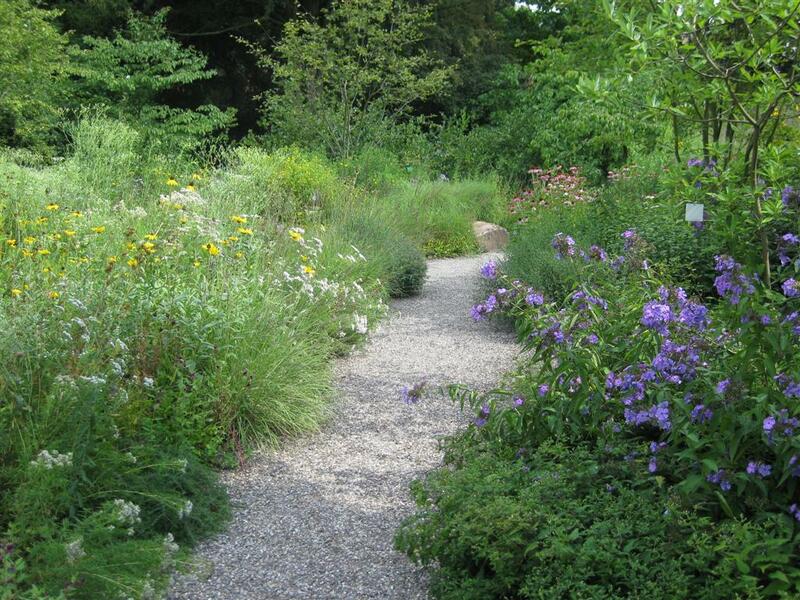 I found it very interesting to contrast these gardens with the previous North American perennial sections. Grasses make up the bulk of the planting, with flowering plants mixed in but at a pretty low percentage. The colour is predominantly green in early August, though it would be very interesting to see it later in the year as grass seed heads and fall colours become more apparent. 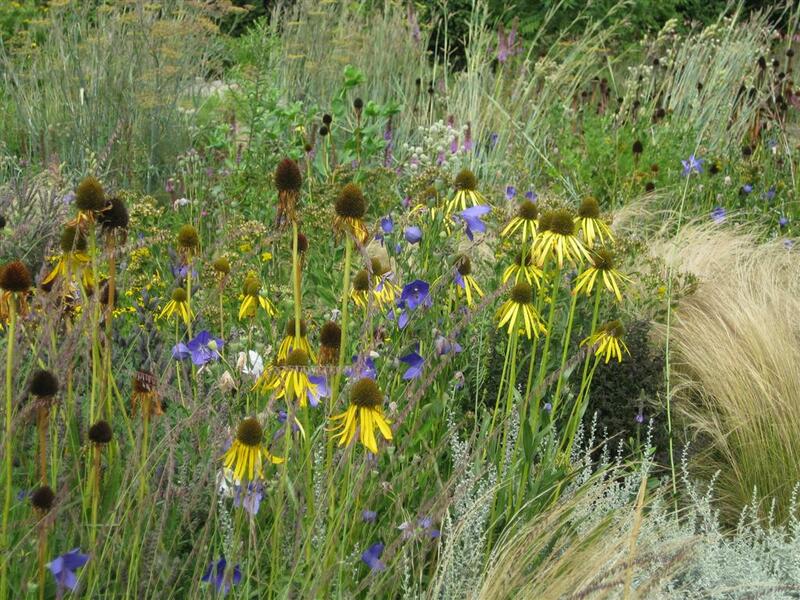 The planting seemed extremely informal and relaxed, but I think that belies its complexity. Flowering perennials were mixed in with layers of grasses in intricate ways. In some instances, there were large colonies of certain flowers, such as Echinacea angustifolia below. In other cases, many different single plants could be found in a small area. 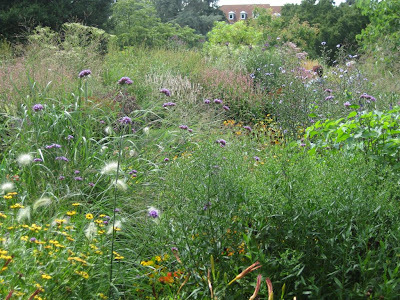 I wonder how much of this is controlled and how much is self-seeded, and what they do for maintenance in this garden. In early August, the height of the plants was already impressive. Walking down some paths, you felt completely swallowed by the vegetation. The best 'garden' experience in my mind. 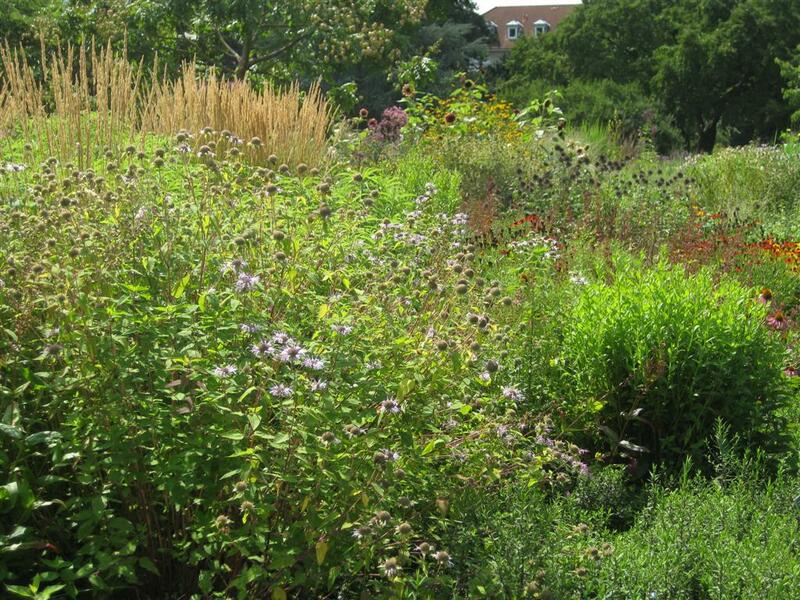 Although the North American prairie garden did get top billing, there were also two sections devoted to its European cousin, the Mediterranean steppe. I particularly liked one of them, which was used as a lead-in to the woodland sections. Shorter grasses dominated the scenery, and I especially admired the fluffy, soft seedheads of the grass below. Anyone know what it might be? Autumn moor grass (Sesleria autumnalis) also looked great, with very clean, bright green foliage. It was the perfect partner to lime green Peucedanum verticellare, which I didn't know before but it was used to great effect throughout this area. The prairie and steppe sections at Hermanshof are some of the most complex and interesting gardens I have seen so far, and I think it’s especially impressive to find them in a public park. It’s quite bold to use so few flowering plants in a public garden in a very non-traditional design. But there were a lot of people walking around who really seemed to enjoy themselves and pay close attention. Perhaps a small example that people will respond to many kinds of gardens. I'm afraid there will have to be a part three for Hermannshof – it's getting late and I just haven't had the time to go through all the woodland pictures yet. And I have to pack for a trip home to Canada! Hurray! Of all the gardens showcasing the exciting horticultural developments now happening in Germany, Hermannshof is probably the best. It was at the top of my garden visiting list for a while before I finally made it there last summer. Hermannshof combines everything that is great in German garden design. First, it is a public park and free for anyone to stumble into. Second, everything in the garden is an experiment, and thus always changing, exploring and pushing boundaries. 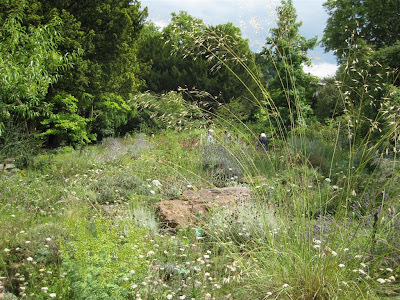 You can see almost everything in this garden because noses are not turned up at any plant family – there are outrageously flashy annual beds side by side with decidedly understated and un-garden like meadows. 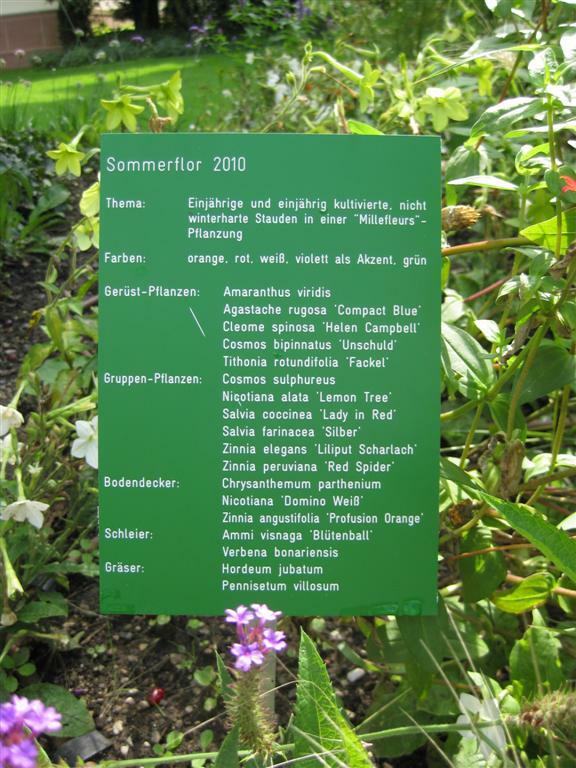 The declared aim of Hermannshof is to study and showcase the modern use of plants. The park is a playground for garden director Cassian Schmidt and head gardener Till Hofmann along with 7 garden staff. And they are playing with a lot of different things – woodland plants, annuals, water plants. 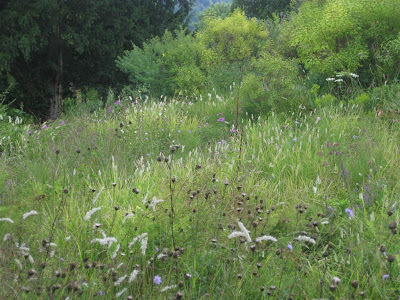 But clearly their passion, if one is to judge by what covers the most ground, are prairies and meadows in their many incarnations. 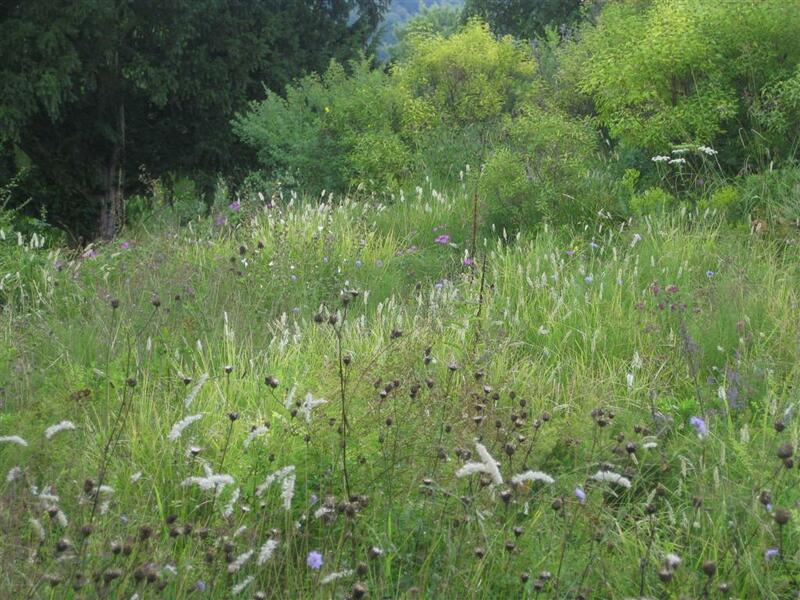 The garden itself is not very large, about 2.2 ha (5.5 acres) in total. There is a densely planted area at the entrance, where several beds are separated by paths and buildings. From there opens the main area of the park, which is roughly square with a circular path around the outside. The plantings are arranged around this circular path, while the center is simply lawn, though it was my impression that the plants were slowly encroaching. 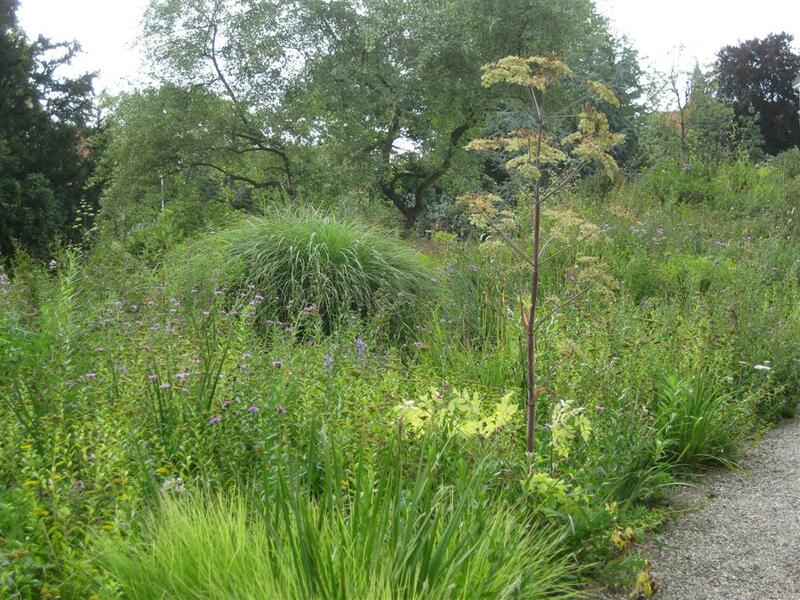 The planting style changes rapidly as you move through the garden to showcase various styles or habitats. A much better map can be found on the garden website here. Close to the park entrance, one first encounters the annual beds. Although I didn't necessarily like all the plants used (I'm biased against certain annuals, such as amaranthus), it was an extremely interesting experiment which proves you can create a very intricate and rewarding planting tapestry based on annuals. 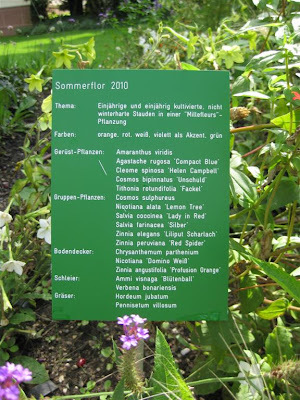 These 'summary' plant labels were posted in some areas, and I thought they really great. Rather than having to crawl around the beds to try to find a tag on each plant, here was everything together! Unfortunately, there were only a few of them around the park. Past these beds begins one of the real show pieces of the garden, the North American perennial section. 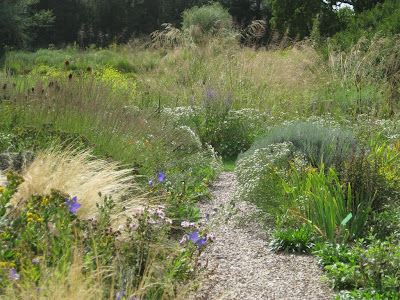 This is not a prairie inspired garden as there are mainly flowering perennials and only a few grasses (I'll have to save the real prairie sections for the next blog - I think Hermannshof is just too overwhelming for a single post). The first sections here were just bursting at the seams with the colour and exuberance of helianthus, rudbeckia and annual zinnia. 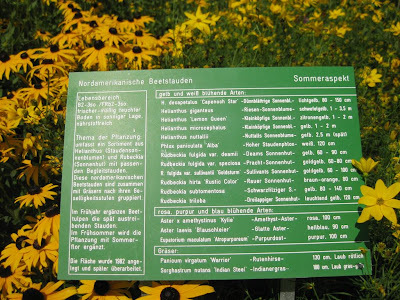 Again, there was a handy summary label, though only some of the plants were listed. We visited on August 8th (this was actually an earlier trip than the one to Peter Janke's garden.. it's all starting to blend together). Already a lot of dry seedheads, such as echinops, were playing a big role. There were also some more subtle colour combinations in places, which were certainly not any less striking. Something to learn from each creation in this place. 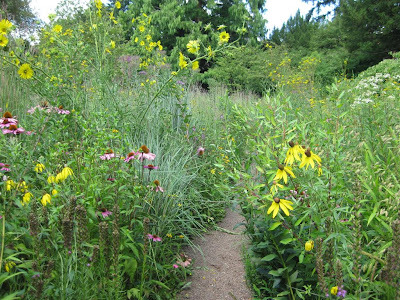 Next time - the prairie inspired gardens at Hermannshof! Hopefully coming sooner than one month from now.